Police have renewed an appeal for a motorist to come forward on the third anniversary of a crash that left two friends dead near Wrexham. Phillip Madden, 19, and Shane Vickers, 22, died when their car hit a tree at Bronington on 30 October 2014. Police said CCTV footage showed a vehicle had followed behind Mr Madden's Vauxhall Corsa before the incident. Christine Smith, Shane's mother, said the driver could have information to provide the families with closure. She said: "The pain we have had to live with is not knowing all the events that led up to the collision, where our son Shane and his friend, Phillip Madden, tragically lost their lives. "There is evidence that there was another vehicle following closely behind just minutes before the crash. Both families need to have closure. "This vehicle may or may not have been involved. 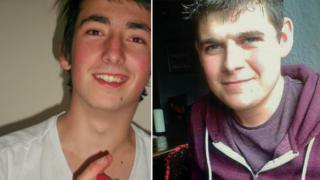 If anyone has any information, no matter how small or insignificant they think it is, please contact North Wales Police." Mr Madden, from Northwood, Shropshire, had been in his final year of an electrical apprenticeship. And Mr Vickers had a joinery and carpentry business, based at the family home in Bettisfield. PC Jo Roberts, from North Wales Police, said the driver or occupants of the following car may have "key information" that could assist officers. "If you are the driver of this vehicle, or have information with regards to who the driver was, please contact us as soon as possible," she said.